Major clypeus with distinct median carina; large TL 15 mm plus; alitrunk profile convex with angular propodeum, petiole scale quite thick; trimorphic (?) minors with distinct posteriorly narrowed heads; majors dark red-brown to near black; minors lighter brown-orange to yellow-red. 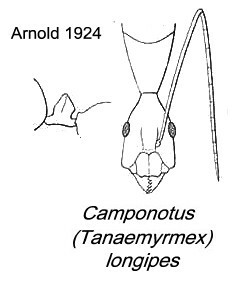 Most catalogued under Camponotus (Dinomyrmex) by Wheeler (1922: 962). Type locality Mozambique (Formica longipes, Gerstäcker, 1859: 262, minor worker; also Gerstäcker, 1862: 509; Forel, 1886f: 164, major; Forel, 1907g: 91, male; replacement name Camponotus etiolipes Bolton, 1995: 98) - type images not on Antweb (September 2014); major and minor workers and male only described (see Bolton, 1995) . Gerstäcker's (1859, as longipes) brief description is at . Forel's (1886f, as longipes) description is at . Forel's (1907g, as longipes) description of the male is at . Arnold (1924: 680, as longipes) gave a translation, this is at . Known from Mozambique, Malawi and Zimbabwe. The photomontage of a major worker is collated from http://www.antweb.org/specimen.do?name=casent0906922. This and the minor below were listed by Arnold (1924). The photomontage of a minor worker is collated from http://www.antweb.org/specimen.do?name=casent0906923.